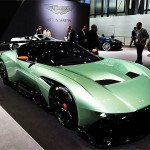 The Aston Martin introduced 2017 Aston Martin Vulcan, a track-only supercar and our most intense and exhilarating creation to date. 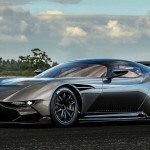 2017 Aston Martin Vulcan born out of extensive motorsport experience – and using Aston Martin’s world-leading flair for design and engineering ingenuity the 800-plus bhp, all-carbon fibre Aston Martin Vulcan promises truly extreme performance. Explore the new standard in the ultra-high luxury supercar class. 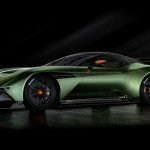 The interior of the 2017 Aston Martin Vulcan features an FIA-compliant full roll cage. This cage provides maximum safety with the minimum amount of intrusion into the cabin. Made from aero-grade 15 CDV 6 Steel enabled us to produce a cage weighing only 32 kg. The strength of the cage has enabled us to use thinner grade carbon in the roof pillars, this saving weight and lowering the centre of gravity. Supplied by Recaro, the seats are full carbon fibre racing seats and are Frontal Head Restraint System (FHR) Compatible. The seats feature an adjustable driver’s side and a fixed passenger side. Securing both driver and passenger/instructor is a Schroth 6-point Racing Harness. Adjustable Pedal Box & Steering Column, In addition to the fore and aft adjustable driver’s seat, to ensure a perfect seating position, Vulcan also features an adjustable AP Racing Pedal box and a steering column adjustable for both reach and height. The clutch pedal enables better control of the rear-mounted (5 1/2″ Sachs) competition clutch for manoeuvring and launch. 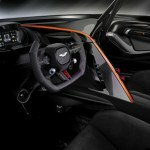 Steering Wheel, 2017 Aston Martin Vulcan bespoke Carbon Fibre design designed and produced in conjunction with bf1systems. Designed in conjunction with Darren Turner, all key functions are grouped in a logical manner. These functions include Starter Button, Neutral, Pit Lane limiter, Indicator, Flash-to-pass, Adjustable ABS and Traction control and Wipers. 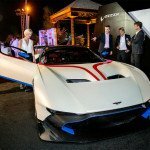 The 2017 Aston Martin Vulcan is fitted with an FIA-spec fire extinguisher system with FIA approved the operating system. The 2017 Vulcan extinguisher comprises a 3-litre system. Driver’s Intercom, To allow easier in-car communication, an intercom will be integrated into both the driver’s and instructor/passenger crash helmets. The same intercom will also allow the driver to pit wall communication. The 2017 Aston Martin Vulcan front LED headlamps comprise Daytime Running Lights, Directional Indicator, Main Beam and Side Lights. At the rear, we have perfected a solution with which to put into production the unique ‘Light Blade’ lamps, first seen on the DP-100 Digital Concept Car. Despite its unique design, this lamp still comprises a brake light and Directional Indicator. 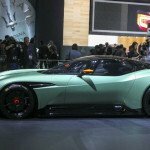 In addition, an FIA-approved rain light is situated in the centre at the rear of the 2017 Aston Martin Vulcan. The front wrap-around screen and side screens are made from hard-coated Polycarbonate. This design is also heated and features an anti-UV coating. 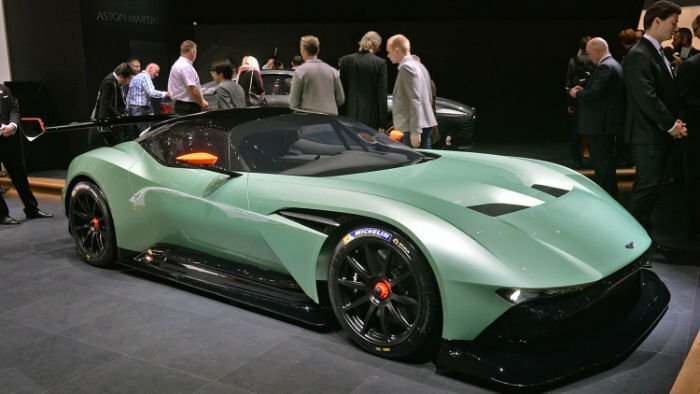 Supplied by IsoClima, the benefits of using Polycarbonate instead of glass include an amount of curvature in the design could not be achieved using glass, Shatter resistant, The Aston Martin Vulcan features a motorsport-based Traction Control System supplied by Bosch. This system features 11 different positions and allows the driver to tune slip angle on track prior to system intrusion as part of their driver training programme. Fuel is stored within an FIA-approved Fuel Cell with capacity for up to 120 litres. The cell is located within the carbon chassis structure for maximum safety. 4 onboard air jacks raise Vulcan to a height allowing all four wheels to be changed. The air jacks are operated by an inserting a high-pressure air line to the rear of the car. 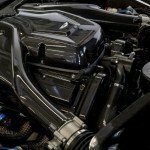 Designed and developed in conjunction with Motorsport Partner, Aston Martin Racing, the unique engine is based on the architecture of the engine found in our GT3 race car, the naturally aspirated V12 has been enlarged to 7.0 and comprises a new block, pistons, liners, conrods, crank – all controlled by a Cosworth ECU. The engine is located completely behind the front axle for better weight distribution and, therefore, dynamic performance. 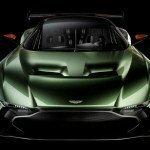 The 2017 Aston Martin Vulcan, the engine will feature 3-position adjustable power outputs which allow the driver to unleash true performance potential as their track skills develop. Introducing the Aston Martin Vulcan – a track-only supercar and our most intense and exhilarating creation to date. Born out of extensive motorsport experience – and using Aston Martin’s world-leading flair for design and engineering ingenuity – the 800-plus bhp, all-carbon fibre Aston Martin Vulcan promises truly extreme performance. Explore the new standard in the ultra-high luxury supercar class.